Native Texan, Andrea Roberts is an Assistant Professor of Urban Planning and Faculty Fellow of the Center for Heritage Conservation as well as the Institute for Sustainable Communities at Texas A &M University. She is also the founder of the Texas Freedom Colonies Project. She teaches planning history and theory, community revitalization, and preservation policy and planning. Her work is concerned with spatial justice, place preservation, planning history, and cultural agency within vulnerable communities. She has written about social justice, intersectionality, and historic preservation for the National Trust’s Preservation Leadership Forum, and African American placemaking for Places Journal and The Journal of Planning History. Current projects include a book about African American historic preservation practice as a form of resistance and a statewide digital humanities initiative dedicated to making disappearing historic Black settlements visible. From 2016 to 2017, Andrea was an Emerging Scholar Fellow at the University of Texas (UT) at Austin School of Architecture. 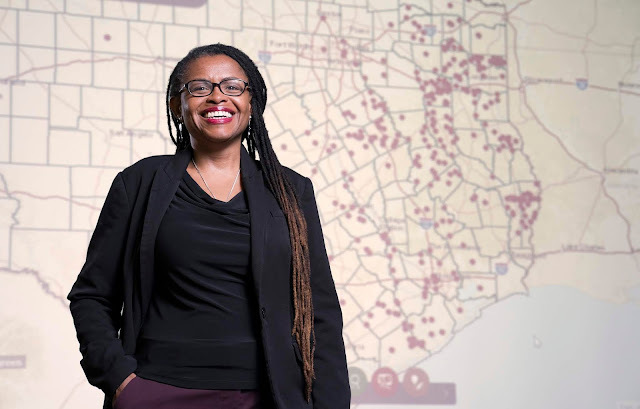 She holds a Ph.D. in Community and Regional Planning with a specialization in historic preservation and African Diaspora studies from The University of Texas at Austin (UT) (2017), an M.A. in Government Administration from the University of Pennsylvania (2006), and a BA in Political Science from Vassar College (1996). She brings to her scholarship twelve years’ experience in community and economic development throughout the US, including with the City of Houston and Philadelphia. Her research identifies planning and historic preservation practices which sustain cultural resilience and further social justice aims within the African Diaspora. She is specifically concerned with grassroots planning history and contemporary place preservation practices within settlements founded by formerly enslaved Africans in the Americas. In Texas, these are known as historic Black settlements, Freedmen's Towns, and Freedom Colonies. Her current work reflects her ongoing concern with African American spatial justice, unrecorded planning and placemaking histories, and the role of cultural agency in land retention. She is currently developing a statewide Black settlement inventory and digital humanities project. Minner, J., Roberts, A., Holleran, M., & Conrad, J. (2018). “A Smart City Remembers Its Past: Citizens as Sensors in Survey and Mapping of Historic Places.” In New Approaches, Methods, and Tools in Urban E-Planning (pp. 95-129). IGI Global. Roberts, A. "The Farmers’ Improvement Society and the Women’s Barnyard Auxiliary of Texas: African American Community Building in the Progressive Era." Journal of Planning History (July 8, 2016): 1538513216657564. Minner, J., Holleran, M., Roberts, A. & Conrad, J. "Capturing Volunteered Historical Information: Lessons from Development of a Local Government Crowdsourcing Tool." Geospatial Research: Concepts, Methodologies, Tools, and Applications: Concepts, Methodologies, Tools, and Applications (2016): 319. Minner, J., Holleran, M., Roberts, A. & Conrad, J. "Capturing Volunteered Historical Information: Lessons from Development of a Local Government Crowdsourcing Tool." International Journal of E-Planning Research (IJEPR) 4, no. 1 (2015): 19-41. Roberts, A. “When Does It Become Social Justice? Thoughts on Intersectional Preservation Practice” Preservation Leadership Forum Blog, National Trust for Historic Preservation, July 2017. Roberts, A. “Documenting and Preserving Texas Freedom Colonies” Texas Heritage Magazine. Texas Historical Foundation, Austin, TX. Vol. 2, 2017. Roberts, A. “Homeplace: Identity, Place, and Planning” Reading List. Places Journal https://placesjournal.org/, April 2017. Brand, A., & Roberts, A. Commentary: Better Communities Require Better-Educated Planners. Austin American-Statesman. Austin, Texas, October 25, 2016. Roberts, A. “Critical Sankofa Planning-Mobilizing Texas Freedom Colony Memories” Not That But This, Ed. Nathaniel Donnett. Houston, TX, June 19, 2015. Roberts, A. “Sacred Forest, Piney Veil: Black Landscapes of Deep Texas” Not That But This, Ed. Nathaniel Donnett. Houston, TX, June 16, 2015.